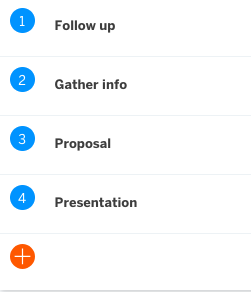 Reminders help your team keep track of next steps and move opportunities forward. The Assistant sends push notifications and emails when it's time to follow up. Customizing reminders will allow your team to quickly set common follow-ups with just a few clicks and allows management to generate reports on customized reminder data. As an Admin, you can customize reminders for your team under Settings > Reminders. Hover over a reminder to edit or delete. To add a new reminder, click the + sign.